Completing the trio of back to back strong teams to play against, Denham welcomed Binfield to the Lane. Binfield, in pole position for the league championship, albeit having played a game more than last week's opponents, Taplow. Denham won the toss and chose to field. Opener Ricky Patel started loosely, failing to find an attacking line and conceding runs while at the other end, Mark Shepard bowled with great skill and accuracy, returning 11-4-33-2. Skipper Faisal Mahmood, having rested himself for a week, brought himself on as first change bowler, and without needing to particularly bend his back, took three Binfield wickets at a cost of 41 runs off of 13 overs. Strong hitting by A.Carson helped Binfield post a total of 229-8 off 52 overs, with Maynard once again impressing with his glove work for the second week in a row. After a flapjackless tea, Denham began their reply to the old ball without due concern but no sooner had the fifth over been completed, the heavens opened for a good hour before the covers could be removed. What remained as a spiced up wicket and a damp outfield, let alone the loss of overs which all spelt DOOM for the Denham innings. Despite a spirited 34 from Bobby Rai and an obstinate 19 from Tang, Denham's batsmen had no answer to Binfield's Barney Sykes who filled his boots with 11-4-30-7. Denham bowled out in the end for just 95. Denham hosted Taplow, a side battling for the Championship at the top of the table with next week's opponents Binfield. Taplow won the toss and batted, seeking the maximum thirty points. Denham started well with Patel soon taking the wicket of Daglish. Thereafter it was a war of attrition with neither side willing to give. As soon as the Taplow batsmen looked like getting away, the Denham bowlers would take a wicket to halt any momentum. Taplow batsman Midlane batted competently without giving away any chances until he was LBW for 54. Taplow finished on 229ao in the 51st over. The Denham reply got underway poorly with a tired looking Tang knicking behind for 5. Thereafter it was a case of gradual accumulation on a track that had improved for the batting side. Rai was stumped following some good glovework by the Taplow 'keeper. Skipper Mahmood, playing as a batsman due to a side strain finally showed glimpses of his ability with the willow with a well crafted 45, in a stand of 89 with Bowry, whose 71 kept Denham in the hunt until he was dismissed late on. The remaining overs were of course skillfully seen out by Nicholas, Maynard et al. to earn Denham a well fought draw, finishing on 198-8 off 49 overs. Despite the addition of old timer Russell Bowry, Denham took ten men to Wraysbury. Winning the toss, Denham bowled first but after a week on tour, openers Mahmood and Nicholas looked short of puff on a wicket that had been played on three times in the last week due to the Wraysbury Cricket festival. Opener Tooze took to the buffet accordingly, soon bringing up his half century. The introduction of the Vore helped to stem the tide of runs and together with the introduction of off-spinner Hassan wickets began to fall. Indifferent bounce certainly aided the bowlers and the Wraysbury innings ended in the 43rd over on 205 with Hassan taking an impressive eight wicket haul. Wraysbury began with the old ball, opting to bowl two spinners. Neither Tang nor Mahmood fell for the ploy though and tucked into some easy runs before the new ball was taken. The game immediately changed as almost immediately Mahmood was dismissed leaving a ball he believed would swing away. Wasim came and went while at the other end, Baig was making Tang hop all over the place with a mixture of short and full away swinging deliveries. By this point the wicket was becoming totally unplayable, some balls scuttling through without bouncing, others rearing up for the batsmen to smell. The uncertainty put paid to the Denham reply and soon Tang was put out of his misery by Baig, Denham wickets began to tumble. When all seemed lost, the last wicket partnership was dominated by The Vore - black trainers donned, batting without a box - who showed the top order how it was done, flailing the Wraysbury bowling to the leg side boundary with apparent ease to become second top scorer in the Denham innings behind Tang. It was not to be however, as number 9 Hassan was bowled to give Wraysbury a 80 run victory. Denham took a weakend side to Chalfont. Losing the toss, Denham were inserted under the threat of localised thunderstorms. The innings began steadily, but soon the wickets were tumbling with nobody in particular troubling the scorers. An hour long break during the innings did not help either, making the wicket more difficult to bat on and the outfield noticably slower. With the sun shining during tea, the wicket and outfield improved, making the job of chasing down the low target of 125 much easier for the Chalfont batsmen. Despite the early dismissal of Chalfont opener Cross, wayward Denham bowling helped the opposition chase down their target in 30.4 overs, winning by eight wickets. Denham travelled to Binfield on Saturday for a difficult fixture against one of the top sides in the league. A rare victory at the toss meant that Denham were in the field to begin with. However with two players running late, chances were missed early on due to gaps in the field. Binfield kept up a steady pace throughout their innings without ever taking the game away from Denham. Three wickets for Jugnoo and two each for Mahmood and Shepard held the home side to 231/8 from their 52 overs. Denham’s response started badly as Jugnoo was out in the second over. Denham were unable to build partnerships against a strong bowling attack and only the in-form Malik (46) was able to hold any resistance. The plan was to try to get up to as many runs as possible rather than block the draw and 150 was passed before the final wicket fell. The 1st XI now lie 6th in the table but just 4 points off 4th. 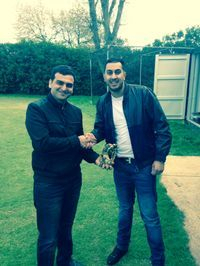 Denham travelled to Amersham Hill with the late withdrawl of Bobby Rai due to illness, being replaced by Denham 2nd XI veteran Atwal. Losing the toss on a wicket with a slight green top to it, Denham were inserted. The Amersham bowlers took to their task with relish, bowling just short of a length to extract as much from the wicket as possible. Both openers departed cheaply to the new ball, both falling to Amersham opener Richardson-Hill. The further losses of Wasim, Maynard and Bhatt, combined with the difficult to put away bowling of Amersham meant Denham were staring at a score of 116 for 6 off 30 overs. Nicholas, fresh from scabbing a ton last Sunday, joined the fasting Malik at the crease and with the ball becoming softer and the summer sun sapping the strength of the Amersham bowlers, began to put the ball beyond the boundary ropes. Malik fell for 76, with the partnership two short of a hundred, but by this point the Hill were onto their fifth string bowler and Denham were well set at 200 for 7 in the 40th over. This allowed Shokat, Shepard and Mahmood to bludgeon the remaining balls for peneth, taking Denham to 251 for 9 declared off 51 overs. After an average tea (scraping an average only due to the home baked and decorated cake on offer), Denham knew from the table that at the very minimum they had to prevent Hill from winning. Knowing that the home team's batting was short on confidence, Denham opened with Mahmood and Shepard, the latter producing bowling that kept the Hill batsmen from scoring, allowing Mahmood to take two early wickets. McKenzie demonstrated craft and timing with the bat, hitting boundaries on an ever flattening pitch, but when Shepard finally got his man, Hill were 5 down and looking shaky. The arrival of Richardson-Hill at the crease steadied the boat somewhat, but ongoing Denham pressure, the unfortunately errant umpire's finger (Dharmasena anyone?) and the elbow spin of Jugnoo captured the remaining Hill wickets, securing Denham 1st XI 30 vital points. Denham blocked out for a gritty draw at the Lane on Saturday against a strong Wraysbury side. After skipper Mahmood won a rare toss, Denham asked the opposition to bat. Openers Mahmood and Shepard bowled well to stop the visitors getting off to a quick start. Seven overs a side were lost to rain half way through the innings which meant Wraysbury played aggressively in the second half to reach 207/7 declared from 44 overs. Nicholas was the pick of the bowling with 3-27 from 10 overs. Denham stayed in the hunt for around 30 overs of the run chase although lost regular wickets throughout. Hasan batted well for 32 but lost concentration when the spinner came on and threw away his wicket. It was a flurry of middle order wickets however that halted the Denham run chase and left Mahmood and Nicholas to block out the last 10 overs for the draw, with Denham finishing on 147/8. With a week's worth of good sunshine to bake the wicket dry, Denham entertained WWCC without regular 'keeper Bhatt with Maynard donning the gauntlets this time around. The toss was lost on a day where the forecast was for on/off showers - overs reductions were likely to come into play. Following a delayed start (1.30pm), Denham batted first on a good track that offered something for the bowlers also. Regular opener Malik was once again late, having an appointment to trip his beard so close friend Wasim Mohammed stood up to the plate to open alongside Tang. Two separate games of cricket soon developed, with Tang defending anything straight yet punishing any width with impunity. At the other end however, Mohammed seemed to prefer a more cavalier approach to opening, with mistimed shots luckily landing in between fielders. The run rate was not slow however, and the first wicket fell at 78 in the 15th over when Mohammed played all around a straight one from WWCC leggie Cloudesley Long. Thus signalled downpour, a downpour that meant an early tea was taken. When play was finally resumed, the game had been shortened to 34/30 with Denham having batted almost half their allocation. With the need to increase the run rate, Malik soon fell, and Tang, having completed his half century, followed soon afterwards. Tight bowling by WWCC veteran West along with leggie Long meant that runs were hard to come by for successive new batsmen. Denham eventually finished on 146 for 7 off their 34 overs. Knowing a relatively low target had been set, Denham took to the field. With skipper Mahmood once again bowling out of his skin, offering unplayable ball after unplayable ball, WWCC struggled to get any consistent runs on the board before the first wicket fell. Stuck between chasing the target and keeping their wickets intact, further WWCC wickets fell. Stubborn resistance from opener Andy Elliott was ended by sharp fielding at third man to effect a run out. Thereafter, the WWCC innings became one more of survival, and despite Scarborough offering some run scoring capability, the game ended in a draw, with WWCC ending up on 104-8 off their 30 overs. A superb effort by the boys in the field, combined with supreme bowling from skipper Mahmood made this result almost a disappointment as a win was always on the cards for the home team! It all looked like it was going to be a shambolic day for Denham 1st XI when this reporter arrived Saturday’s venue. The entire Penn & Tylers Green Team were practicing on the outfield, readying themselves for the afternoon’s cricket. The Denham team were nowhere to be seen. Gradually one or two players arrived but by the time of the toss, only five Denham players were present. It turns out an accident around Beaconsfield had delayed the other half of the team. Denham lost the toss, were put into bat and were hopeful of a few minutes grace from the opposition to allow the remaining players to arrive. Very little was given, so hopefully they won’t require a favour in the future..... So it was up to makeshift openers Ikky Shokat and ever green Sir Stuart Payne to open the innings. After Shokat was bowled in the first over and Sir Stuart followed soon after (surprisingly given out LBW for only the 130,678th time in his career! ), it looked like it was going to be a short afternoon. However Maynard and Malik rebuilt the innings taking the score into the 80s before Maynard (19) was out to a leading edge. Malik and Wasim continued the Denham fight back taking the score to 130/3 after 29 overs with Malik passing 50 for the second time this season. However when Wasim was out caught and Malik (69) followed next ball adjudged LBW, Denham were again back in trouble at 130/5. Rai (39) and Nicholas (45) then produced an excellent partnership to bring the innings back on track, running well between the wickets and punishing the bad balls, whilst still being watchful on a difficult pitch. Some good hitting from the late order allowed Denham to reach 244/8 by the close. Highlight of the innings by far was the bye taken to the wicket keeper by Mahmood and Shepard. The wicket keeper dropped the ball and Mahmood called Shepard through for an unlikely single that Shepard initially refused leaving both batsmen at the strikers end. The wicket keeper hurled a throw at the bowlers end for a certain run out but with no one backing up, it gave the batsmen a chance to make it back to the bowlers end. However both batsmen decided to run to the bowlers end, halfway down the track they realised this and paused, only to both begin running again for the same end! Eventually Mahmood turned and scampered back to the strikers end and to safety. Utter buffoonery! Denham’s bowling response started exceptionally as Penn slumped to 15/4 from 10 overs with Mahmood bowling five maidens on the spin and taking three wickets. The innings was rebuilt well however with some strong hitting to the short boundary. But wild card Jugnoo (3-45) removed the dangerous Radford for 46 with a good quicker ball and they were back in trouble at 100/5. Another partnership was built by Mason(59) and Tattersall (36) but when Shepard (2-55) bowled Mason, Denham were back in charge and were able to finish off the opposition with an over and a half to spare, with Mahmood taking the final two wickets to finish with 5-19. 30 points for Denham leaving them 4th in the table. Shorn of 1st XI regular Nicholas who was away at a wedding, Denham 1st XI entertained (??!) league champions for the second time this season in a game that again was heavily influenced by an under prepared pitch. Losing the vital toss on a wicket more akin to Plasticine than rolled grass, Denham wickets were soon tumbling through a combination of poor shot selection, headless chicken running between the wickets and more poor shot selection with the Littlewick bowlers merely having to put the ball on the spot for the Denham line up to implode. Denham being bowled out for 80 all out . Littlewick took less than 13 overs to knock it off, with opening bat Yaseen showing how it should have been done with 70 not out. Nil pwoins. A strong-as-you-could-hope-for Denham 1st XI entertained, and sometimes blurbed a bit too much to, Amersham Hill 1st XI on an oppresive yet sunny day at the Lane. Losing the toss, Denham were thrust into bat on a wicket prepared for the bowlers. Tang, unwillingly volunteering to open the batting was paired with Wasim at the top of the order due to regular opener Malik having his beard trimmed. Tang survived a first ball LBW shout by Hill regular Richardson-Hill but went on to lay a solid opening start of 41 before Wasim was clean bowled aiming an injudicious swipe at O'Brien (formerly of Chesham Bois fame). Malik, beard trimmed, came in at three, uncharacteristically jittery. He hit a glorious cut before turtling up to Richardson-Hill for successive deliveries, the fourth hitting him plumb in front. Malik maintained he thought he got an inside edge but trudged back to the pavilion in disgust. 'keeper Bhatt came in on the back of two blobs determine to prove his worth with the bat but soon after, Tang, sensing a chance to lay into some lollipop off breaks, drove tamely to cover to end his early resistance for 22. The Hill spin bowling came to the fore and tied down the Denham innings effectively, limiting the run rate to one or two an over at best. Batsmen came and went without troubling the scorers bar Bhatt, who demonstrated his ability with a patient 26 on a difficult wicket for the batsmen. Denham 158ao in the 50th over. Tea featured pickled onions for the first time in a long while, as well as countless items on the menu that were beige, not exactly bowler fodder! Denham took to the field knowing the pitch again was difficult with uncertain bounce in areas and that Hill would have to work very hard to acheive their target. Opening bowlers Mahmood and Nicholas took to their task with relish, Tang almost taking a couple of sharp chances at short leg. The opening Hill bats failed to trouble the scorers but when a regulation chance at mid on, offered by the dangerous MacKenzie was dropped by the 'praying-for-rain' technique of Wasim, Denham hearts must have sunk, fearing more shambolic antics in the field. Skipper Mahmood, getting better and better with each game, took to the task and led by example, not offering the Hill bats anything to score off and threatening to take a wicket with each delivery. Mackenzie was removed LBW by a sharp delivery that cut back in off the seam, sparking a Hill collapse to the 7th wicket, where Richardson-Hill and Fletcher were united at the crease with the Hill score on 54-7, overs not being a problem. With the track getting flatter and flatter, the humid conditions taking their toll on the fielding team, Denham feared being Denham'd. The Hill pair occupied the crease admirably in typical Denham fashion for countless overs before Nicholas sent down a cutter to Richardson-Hill, ending his resistance. No.10 O'Brien threatened to counter attack with some belligerent batting before Tang took a difficult catch at cow corner to bring in the final Hill at. Fletcher tried to farm the strike but smart captaincy by Mahmood led to the No.11 having to face the start of a new over. Sensing his chance, Mahmood brought himself back into the attack for what seemed like one last hurrah, and on the final ball of his over, produced a well-disguised slow ball bouncer, the batsman offering back the simplest of return catches to the grateful Denham captain. 30points for the 1st XI, next up, Taplow away. Denham travelled to last season's champions Littlewick Green again not quite a full strength. Winning a vital toss on a blustery day, skipper Mahmood inserted the champions, hoping to make use of the uncertain weather to his team's advantage. With a couple of interruptions due to rain, steady Littlewick wickets fell, with only no.3 batsman Waseem showing any composure in the bowler friendly conditions. He was joined by no.10 Ahmadzas who bludgeoned 32 runs in quick time to take Littlewick to 114 all out, skipper Mahmood taking 5-44 and veteran Nicholas 5-58. Denham 1st XI began their season shorn of two of their first choice XI, drafting in last season's 2nd XI skipper David Tang, now relieved of the poisoned chalice. On a wicket more akin to a seam of clay, skipper Mahmood duly lost the toss and Denham were inserted. Denham wickets fell at regular intervals, with only O'Hara (33) offering any resistance whatsoever, with extras being the next highest scorer. Denham were bowled out in the 36th over for 101.